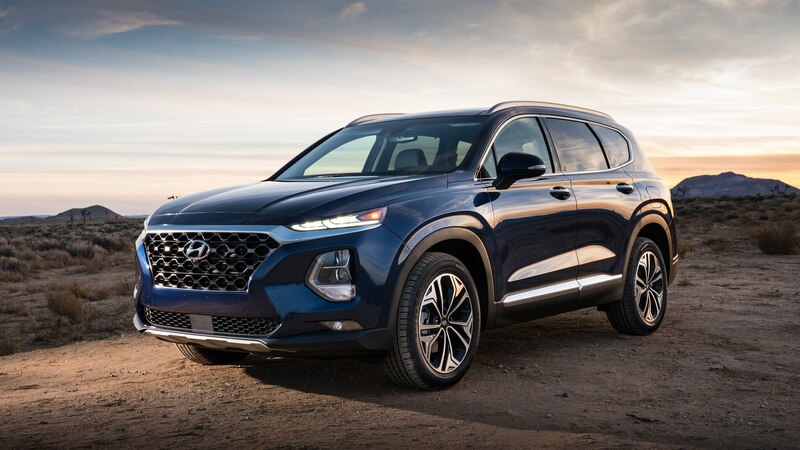 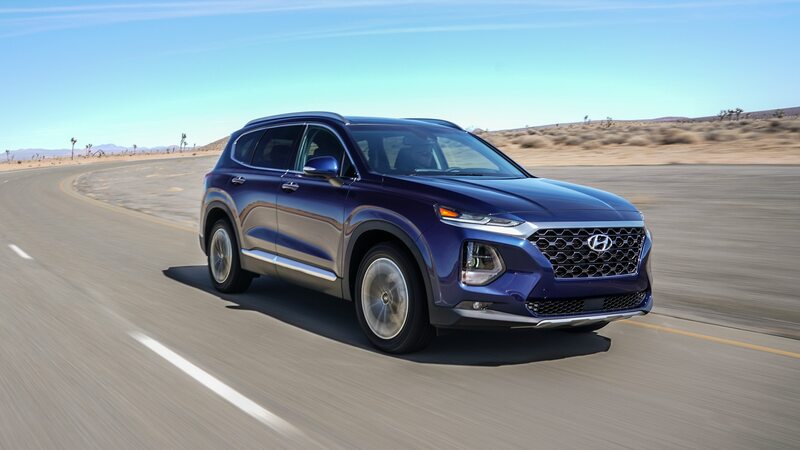 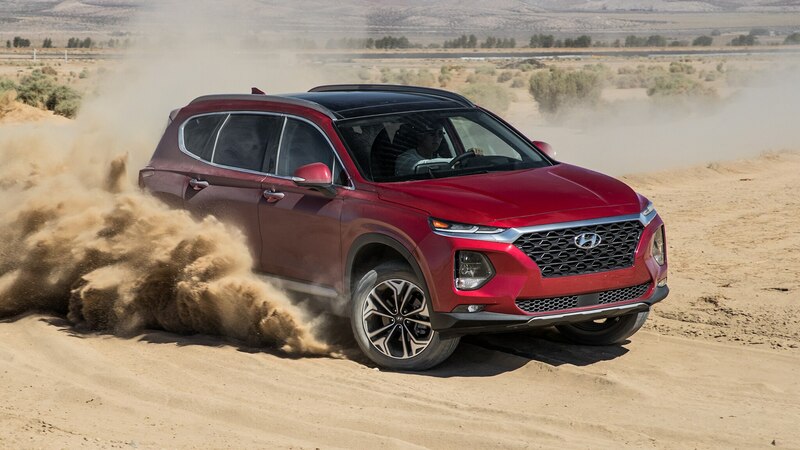 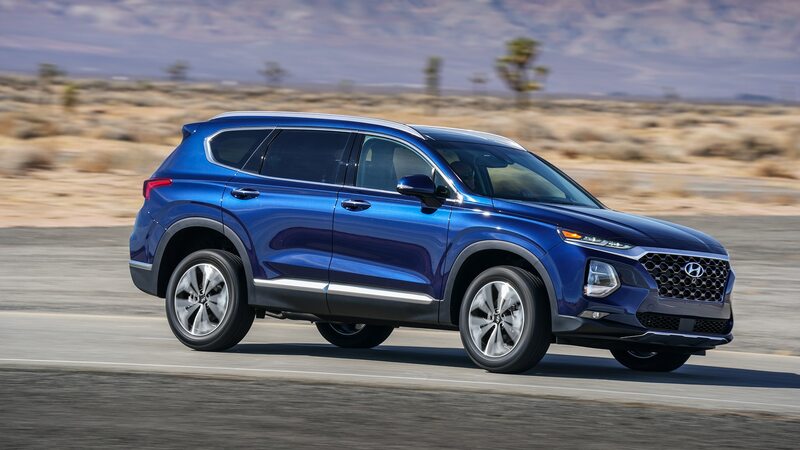 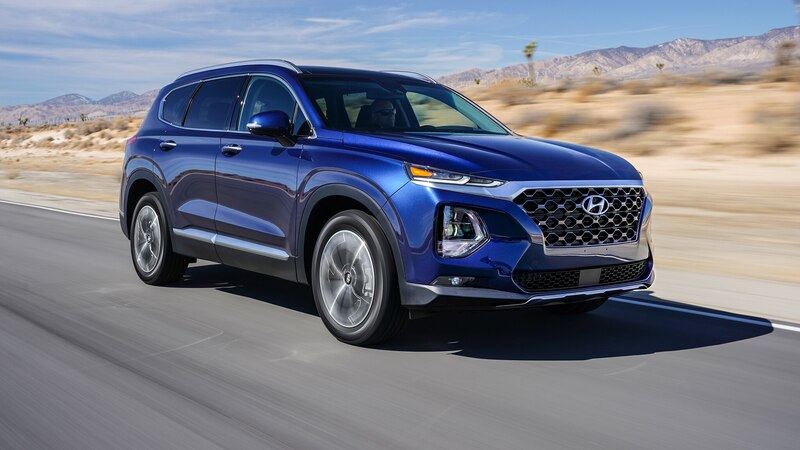 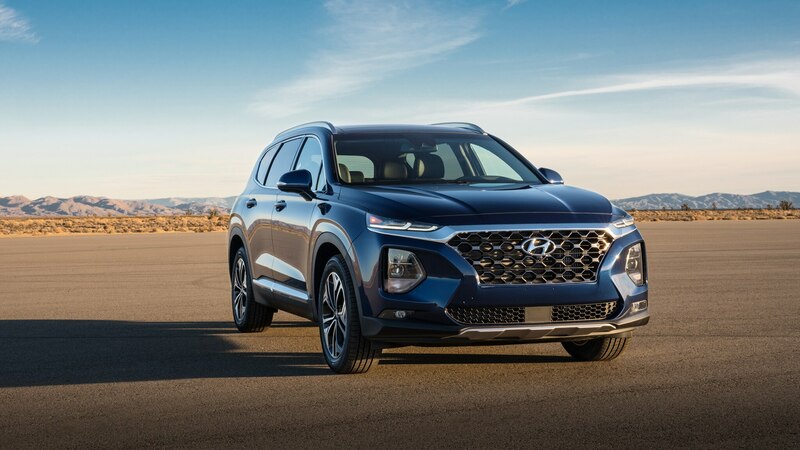 Here’s the scoop in a nutshell: The five-passenger Hyundai Santa Fe crossover is thoroughly redesigned for 2019. 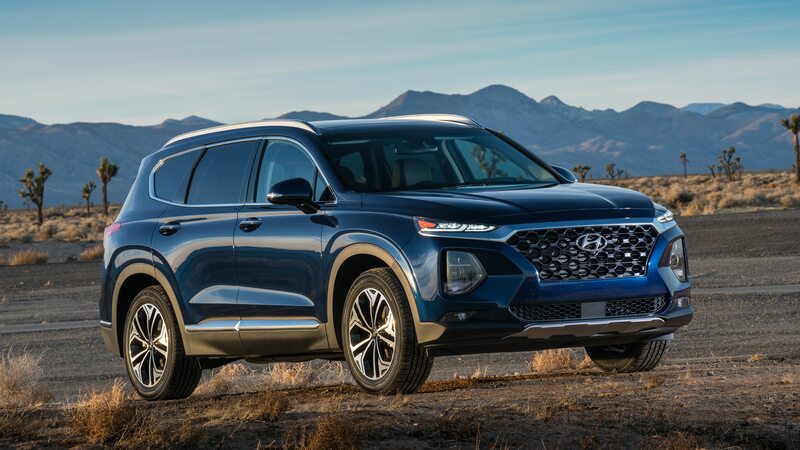 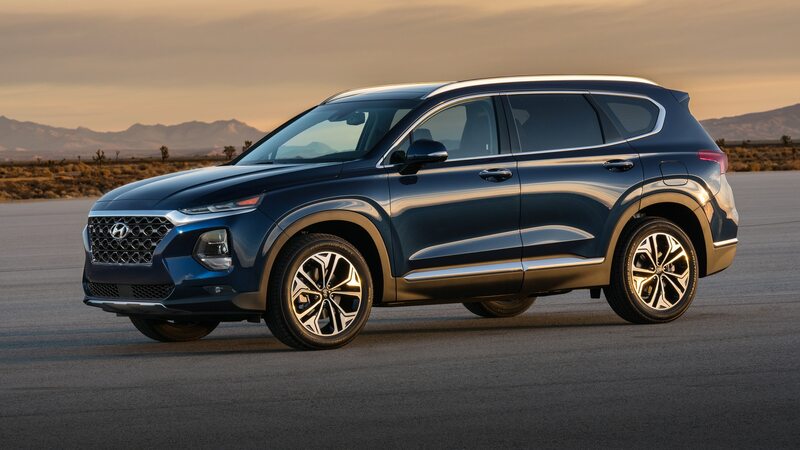 It’s no longer called Santa Fe Sport, either, a nomenclature change made just as the larger three-row Santa Fe XL based on the previous model prepares to give way to the all-new Palisade for 2020. 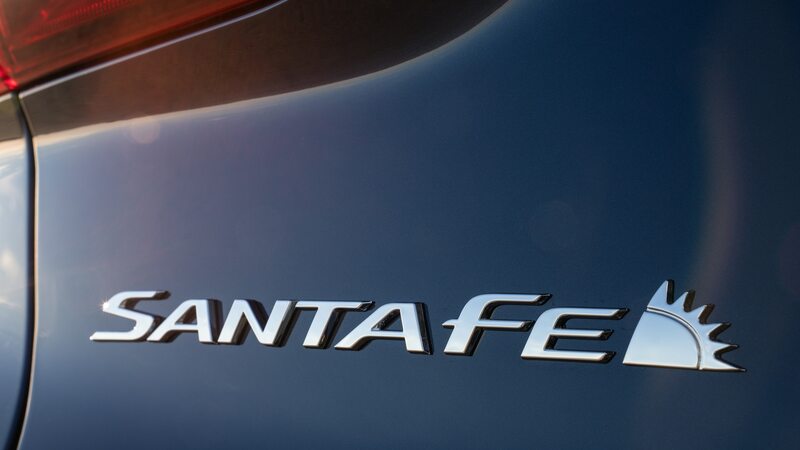 Oh, and there’s this: The new Santa Fe is bigger and roomier than its predecessor in every meaningful dimension. 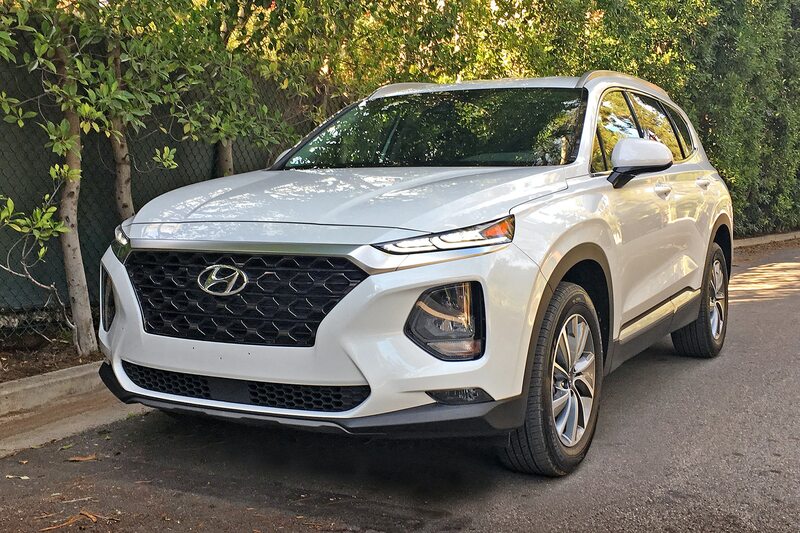 While a slew of trims is available, plus a choice of front-drive or all-wheel drive ($1,700 extra), the test car that showed up on my doorstep for a weeklong stint was a mid-level SEL Plus with FWD. 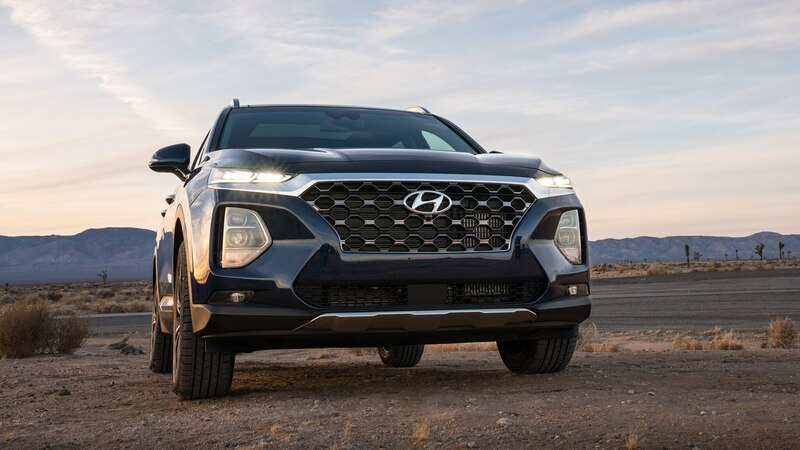 This is a clean and handsome rig, with narrow LED daytime running lights atop LED headlights, both outboard of a chunky egg-crate grille with fog lamps positioned to each side. 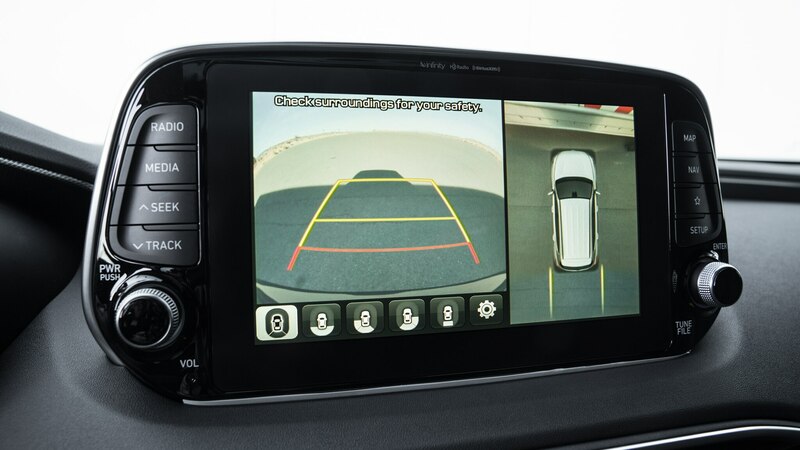 Lithe A-pillars improve forward visibility, while the front overhangs have been minimized. 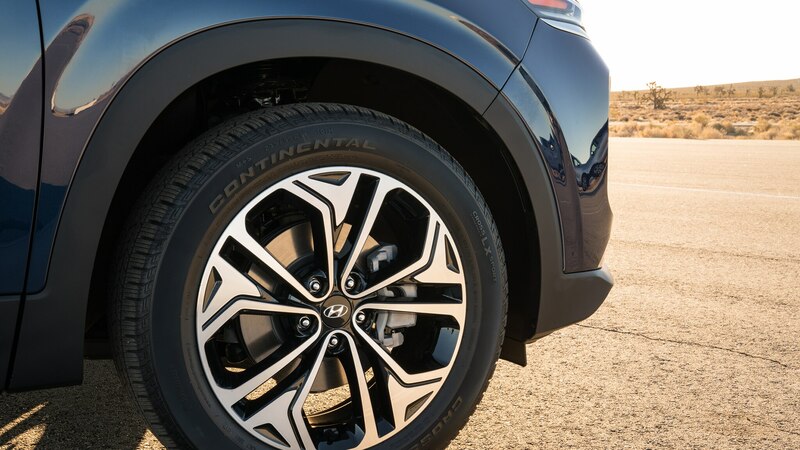 Handsome 18-inch wheels are standard with the SEL Plus. 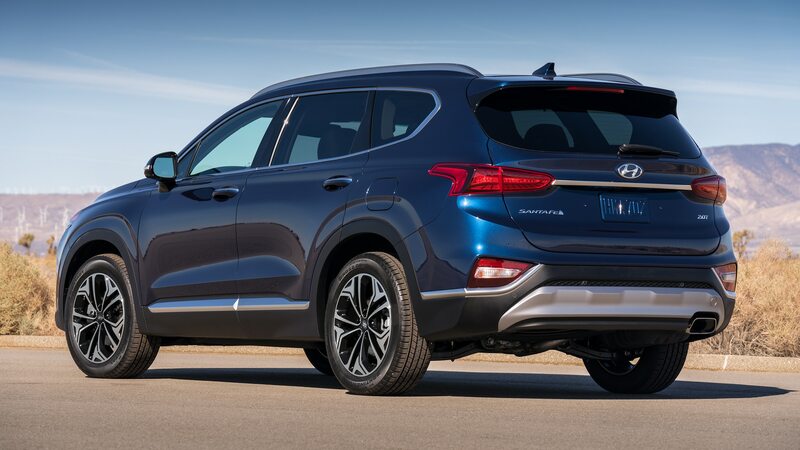 A quick look at the window sticker’s $30,780 base price shows the word “INCLUDED” next to every item on board, save for a piddling $125 for carpeted floor mats. 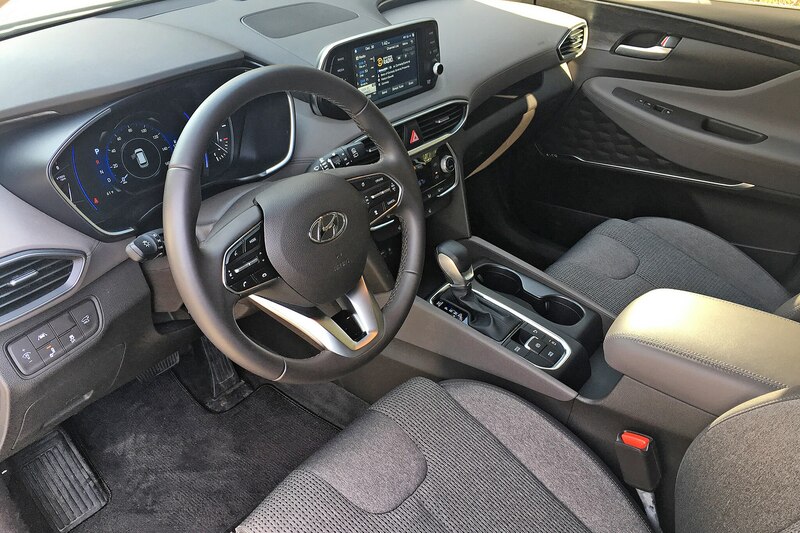 There’s a ton of standard stuff. 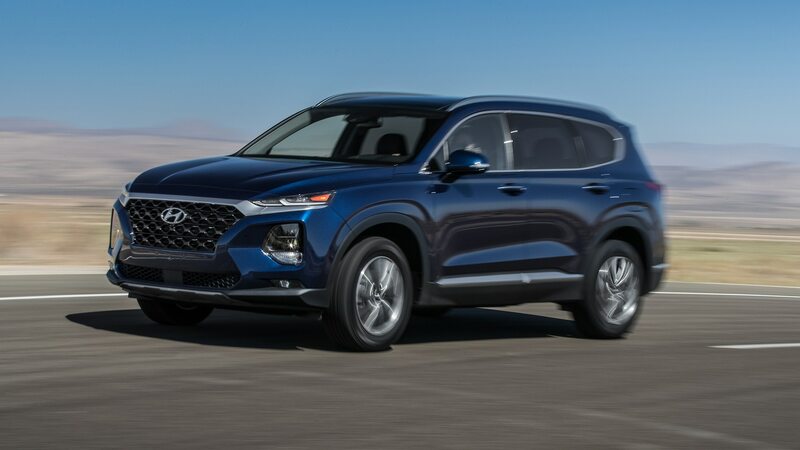 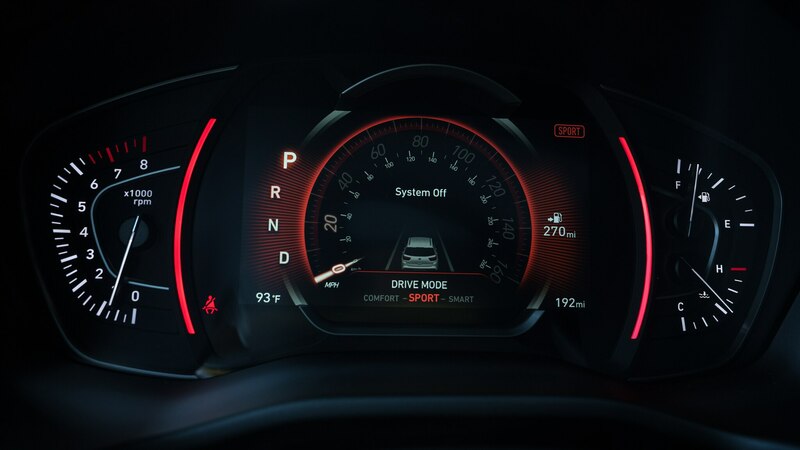 Safety gear includes blind-spot detection, rear cross-traffic alert, lane-keeping assist, active cruise control with stop and go capability, and forward collision avoidance. 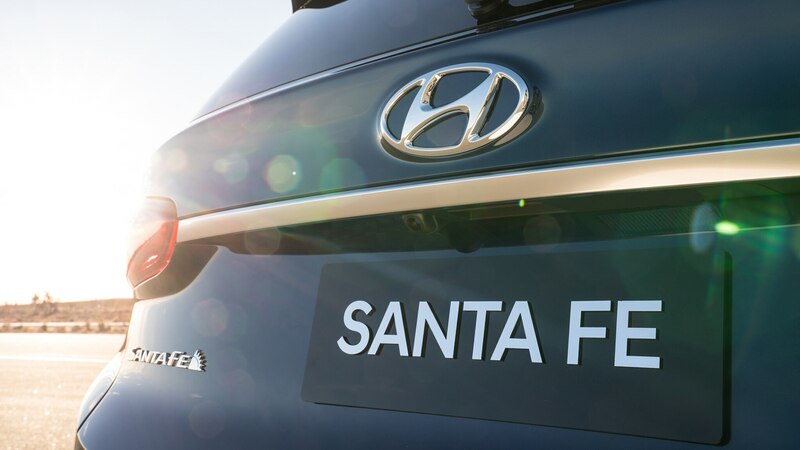 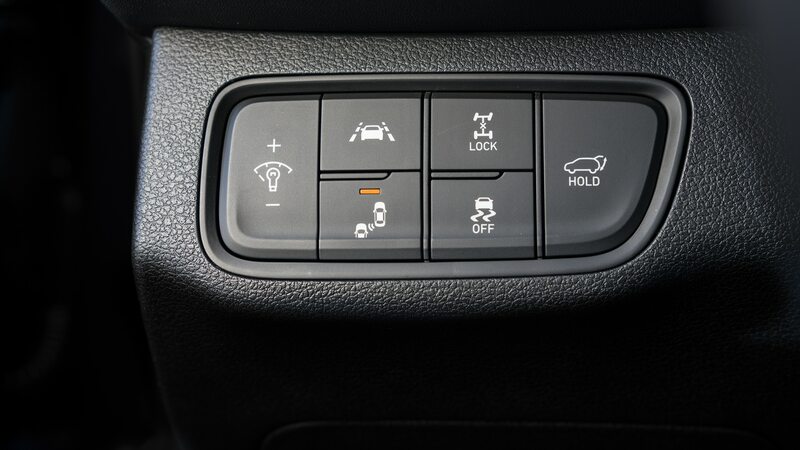 The Santa Fe is also Hyundai’s first vehicle to include across-the-range standard Safe Exit, which warns occupants about opening side doors if a car is approaching from behind (the system can also automatically override the electronic child safety locks to prevent the driver from unlocking them if a car is approaching). 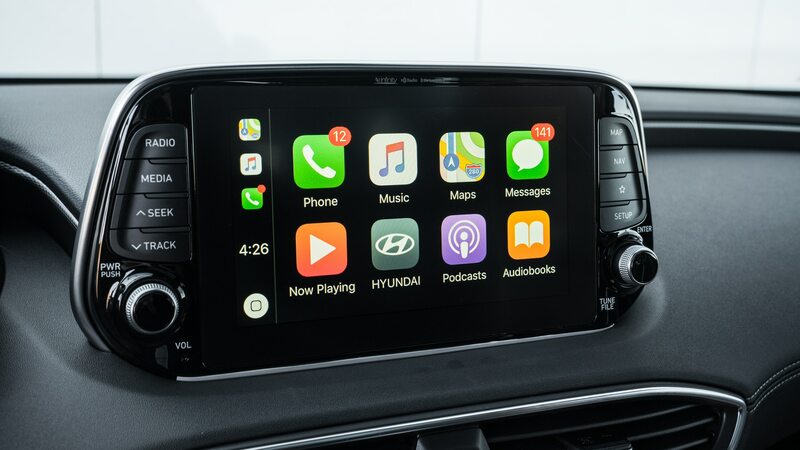 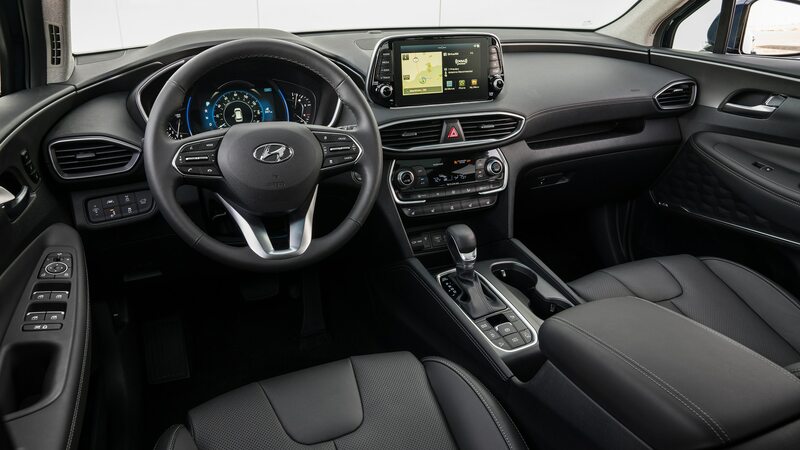 Convenience goodies include an eight-way power driver’s seat (both front seats are heated), keyless entry and start, heated side mirrors, a 7.0-inch color touchscreen with Apple CarPlay and Android Auto, and a premium Infinity audio system with surround sound and Clari-Fi, the latter a function which seeks to wring the best audio quality from compressed digital files. 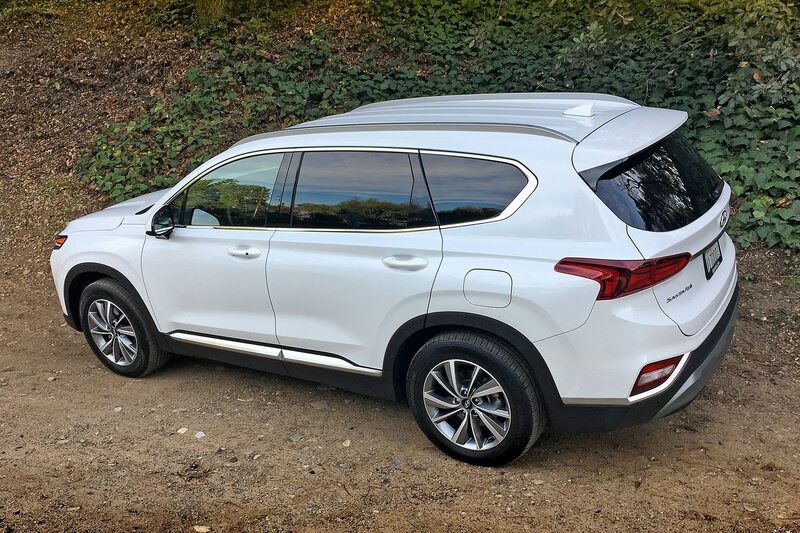 Climb aboard and the new Santa Fe immediately feels airier than its predecessor, particularly in the seats; front hip room has increased nearly an inch. 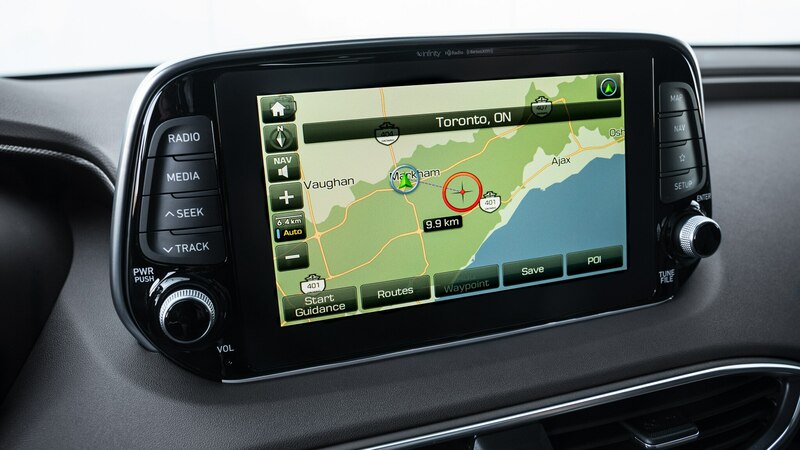 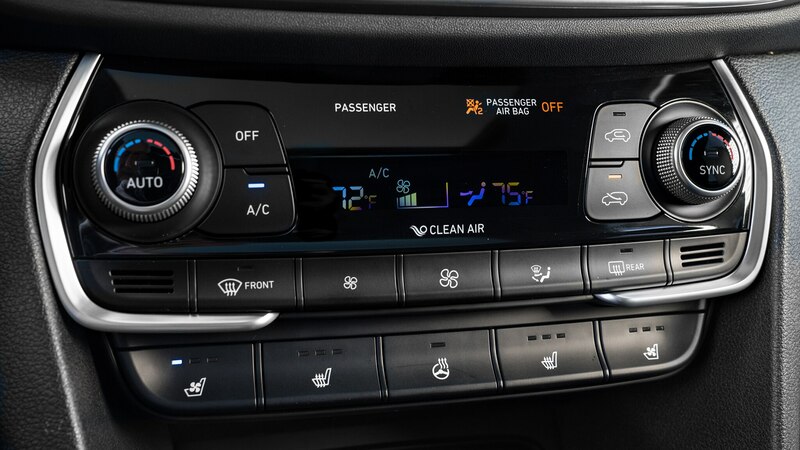 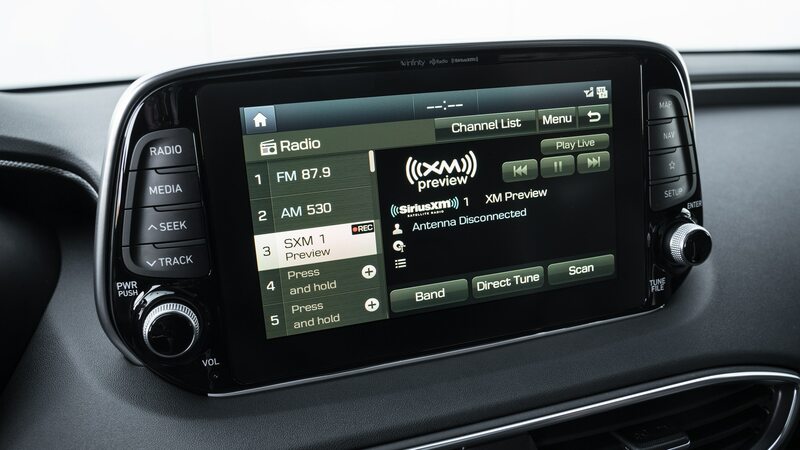 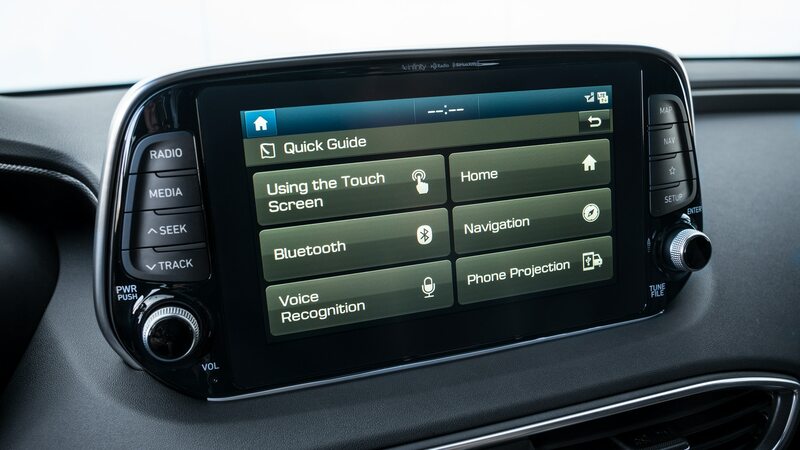 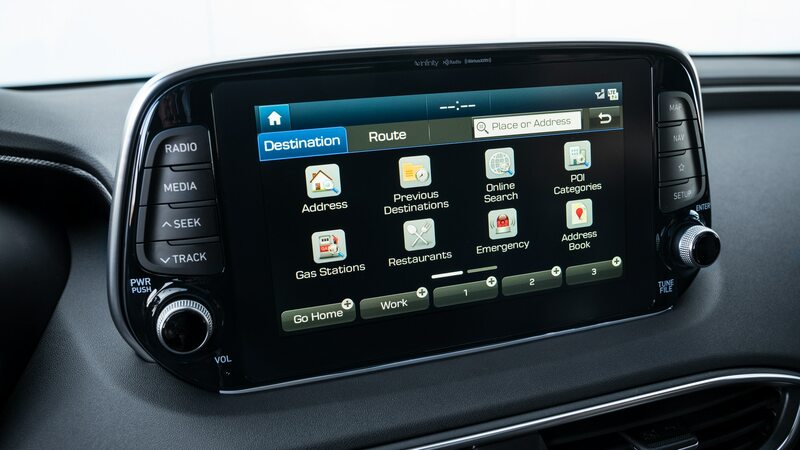 The dash is an approachable mix of digital screens and analog controls, making it a no-brainer to dial-in your preferred radio station (SiriusXM is included) or configure the dual automatic climate control to your liking. 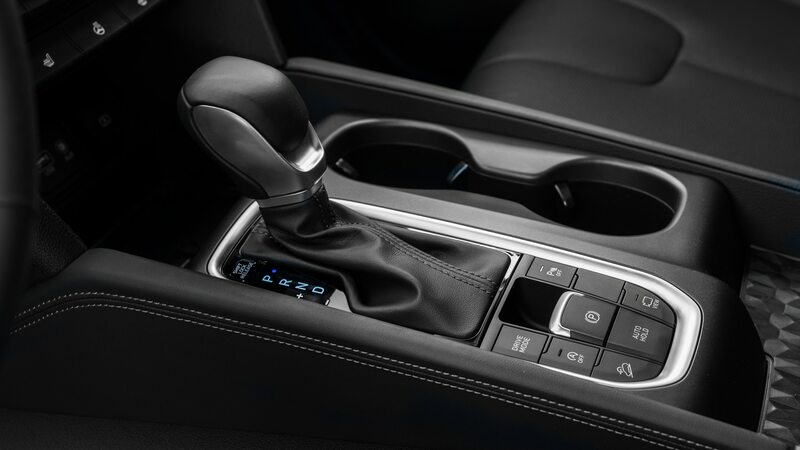 The forward center console includes ports for 12-volt gear, USB, and an AUX input. 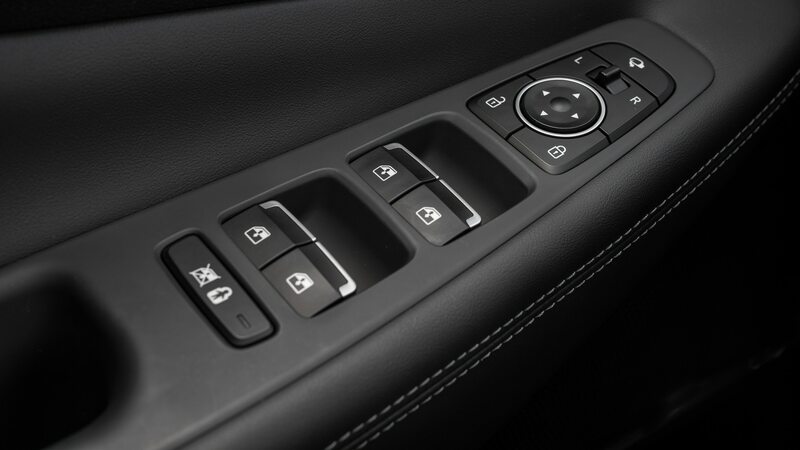 The materials are tasteful and everything is nicely finished, but the overall look is more functional than luxurious. 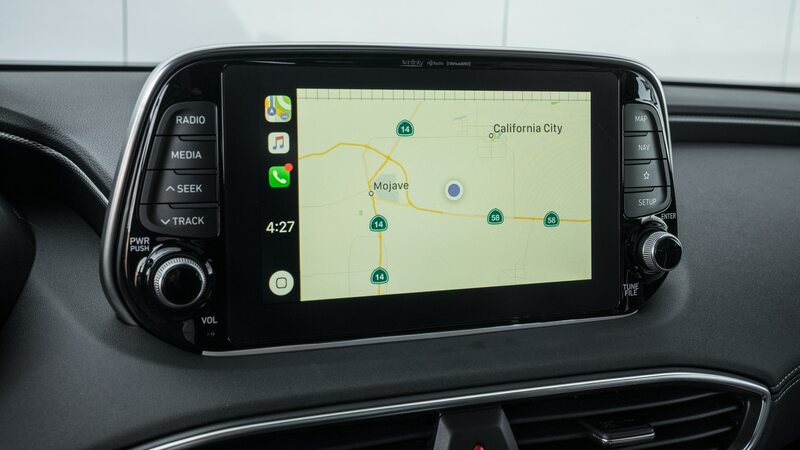 That said, the simplicity of the interface and the resulting lack of annoyances proved more welcome in day-to-day driving than a hedonistic Nappa-leather cockpit full of overly wrought tech. 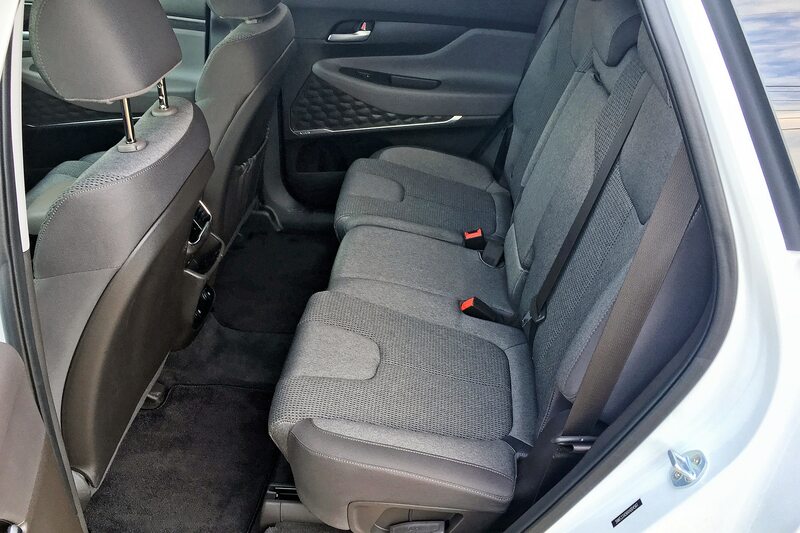 The rear seats gain more than an inch of legroom and there’s enough space for three adults (on short trips at least). 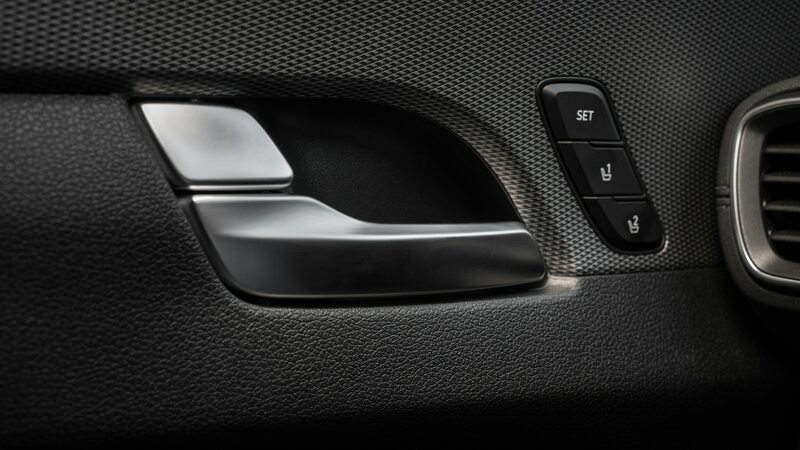 The rear seat slides fore and aft, reclines, and also folds flat. 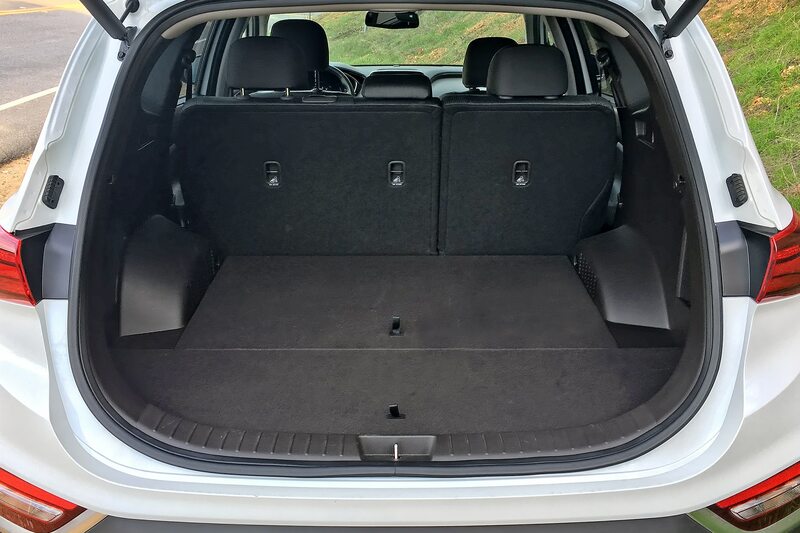 Nearly three inches of added overall length have increased cargo room behind the second row, too. 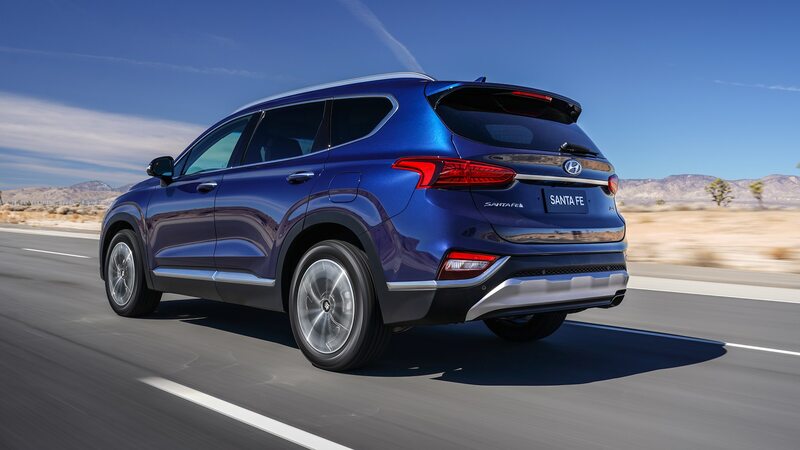 At the rear, a hands-free smart power liftgate is standard. 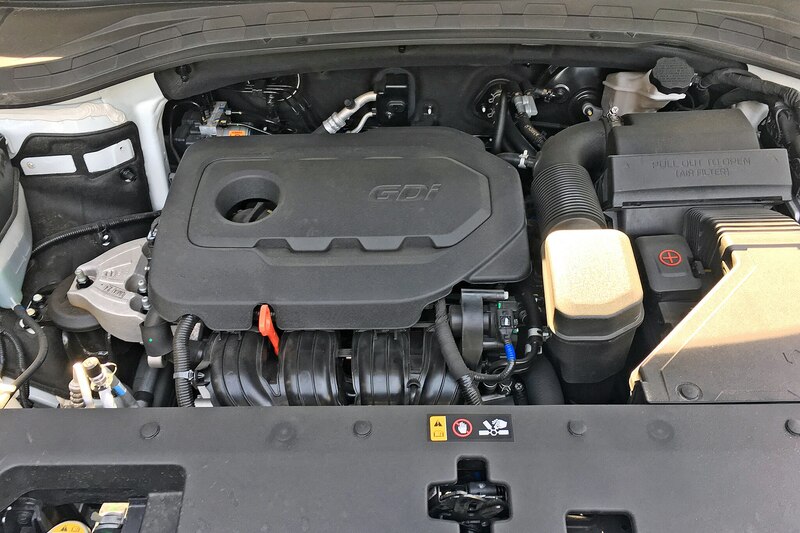 While a 235-horse 2.0-liter turbo four is optional, my example was powered by the standard 185-hp 2.4-liter naturally aspirated four. 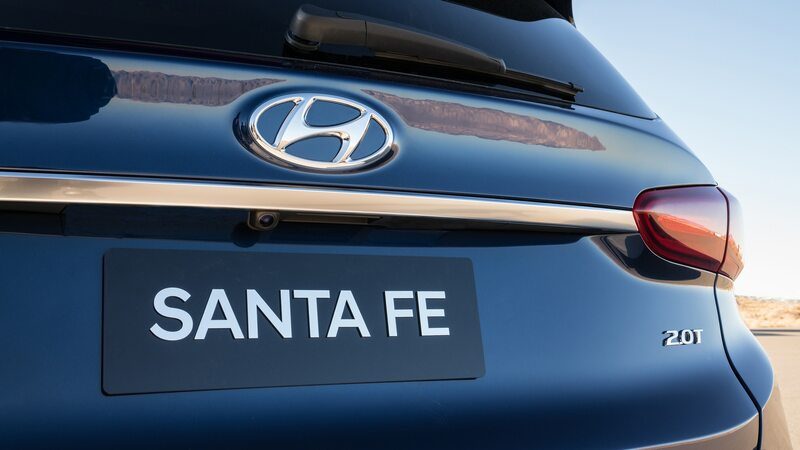 It’s a generally agreeable powerplant, moving the Santa Fe through urban traffic easily and reasonably quiet on the highway—though it can get strident when pulling up a steep grade. 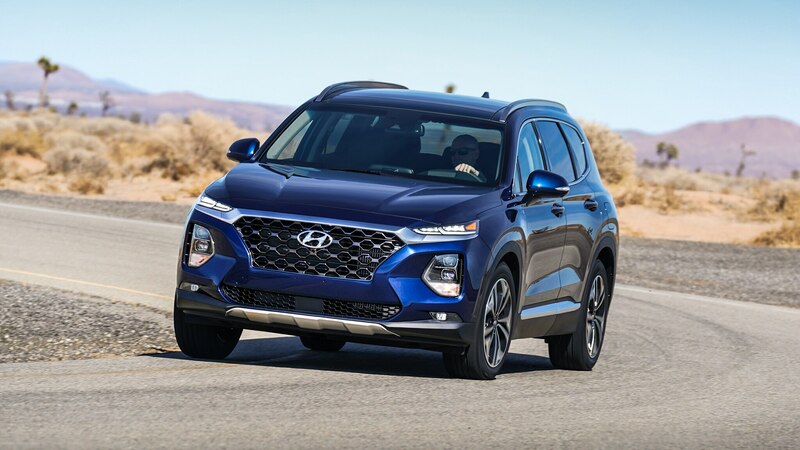 Making the most of all 178 lb-ft of torque is a new eight-speed automatic that greatly improves power delivery compared with the outgoing six-speed. 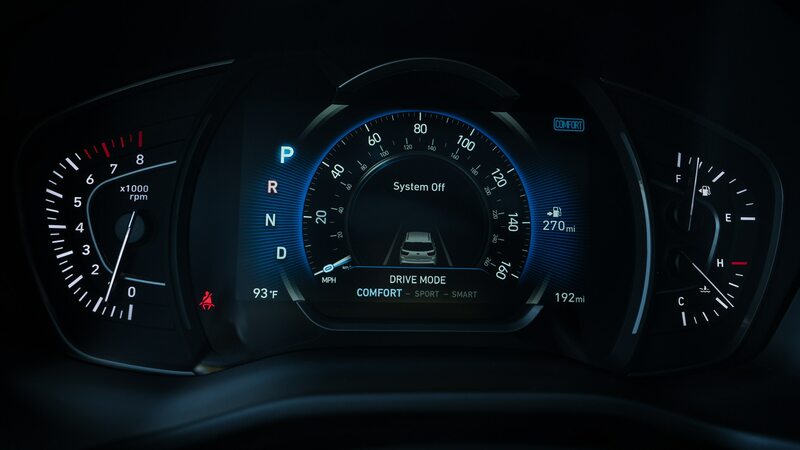 It goes about its work seamlessly and quietly. 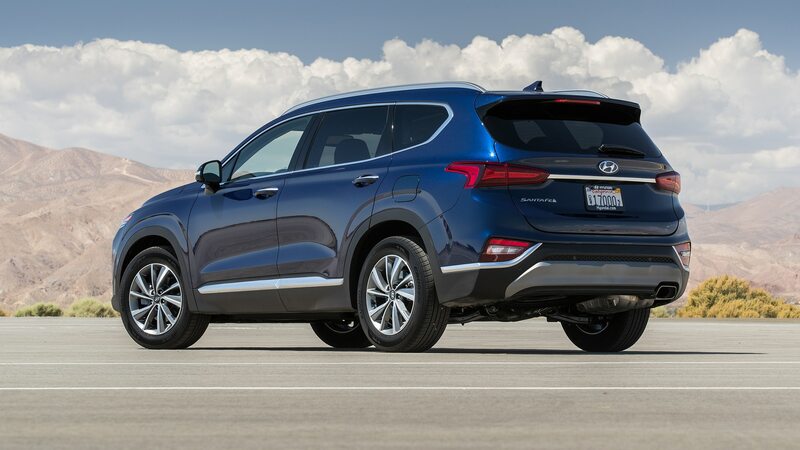 The powertrain earns an EPA combined rating of 25 mpg. 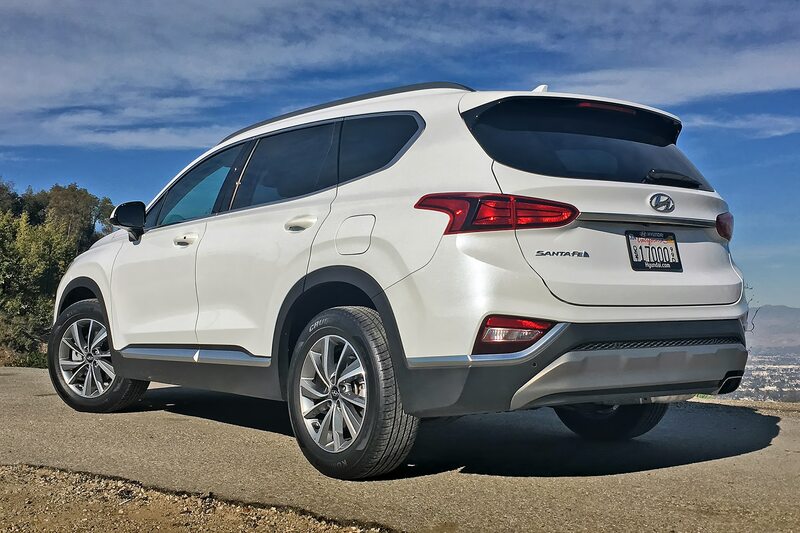 No one would mistake this tall crossover for an enthusiast’s machine, but in almost all but spirited driving maneuvers the Santa Fe excels. 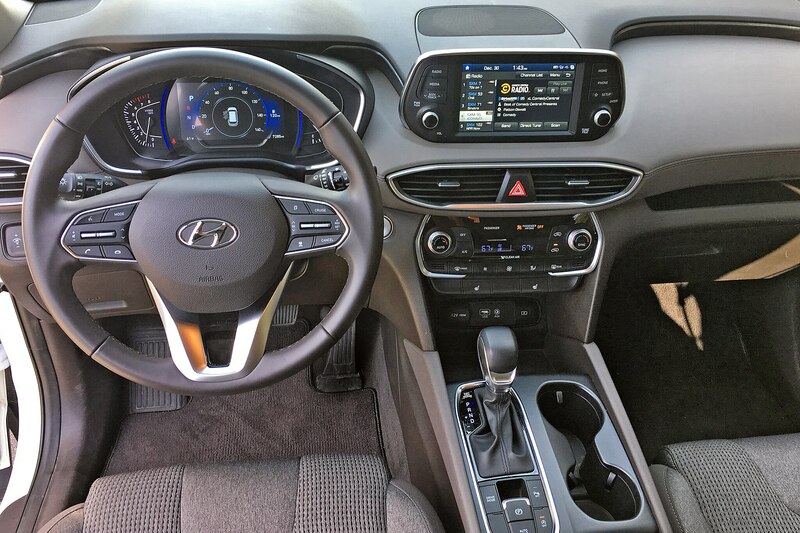 The ride is improved thanks to a revised suspension, and steering is quicker and quite good. 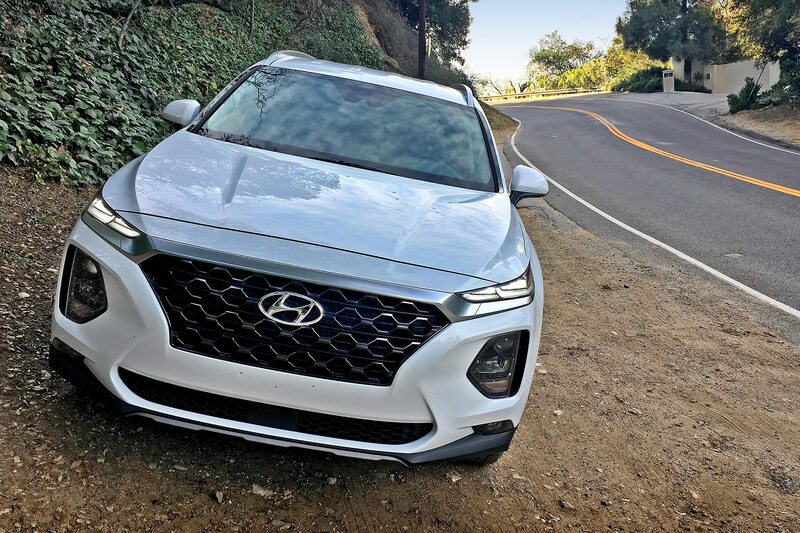 I drove the rig on errands, school-bus pickups, trips to the garden center and the grocery store, and an enjoyable Saturday jaunt to Santa Barbara for lunch and a museum visit—that trip being just under 200 miles up and back for the afternoon. 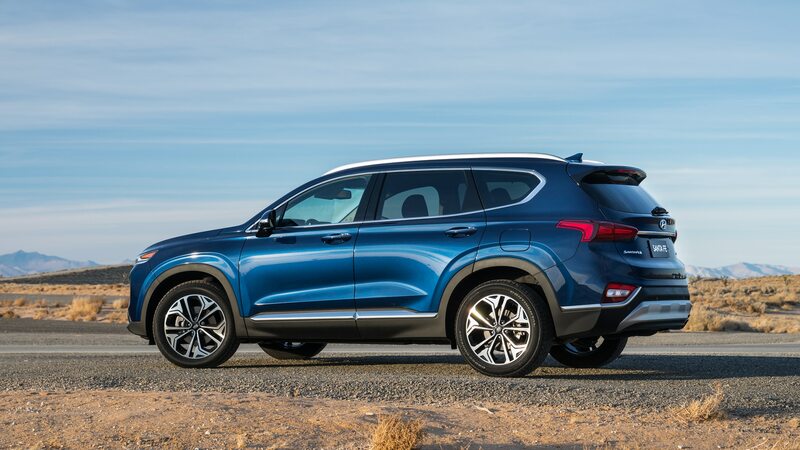 In every situation, the new Santa Fe felt polished and composed, with an abiding feeling of structural solidity and the versatility to switch mission profiles in a blink. 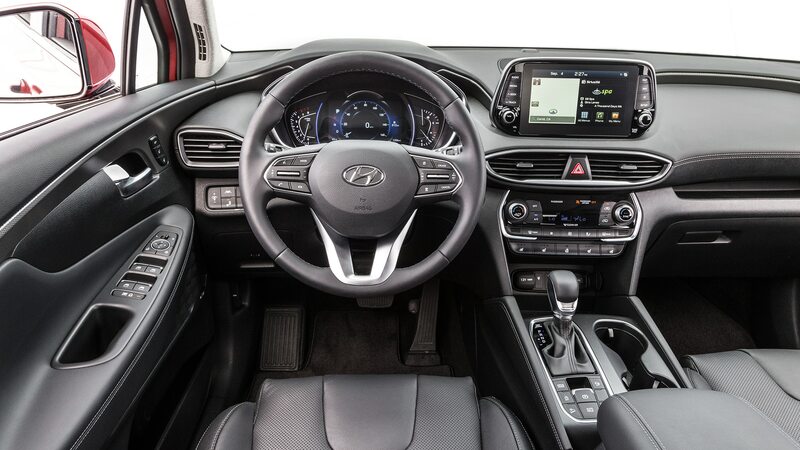 No, the Hyundai cannot match the premium labels in richness of feel or finish. 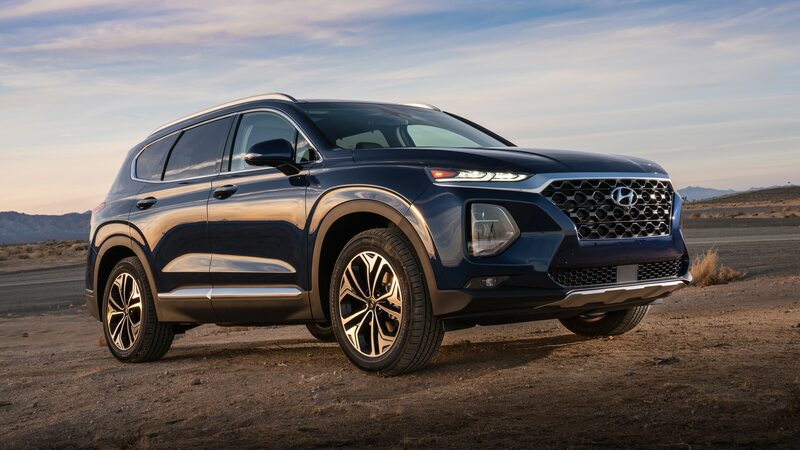 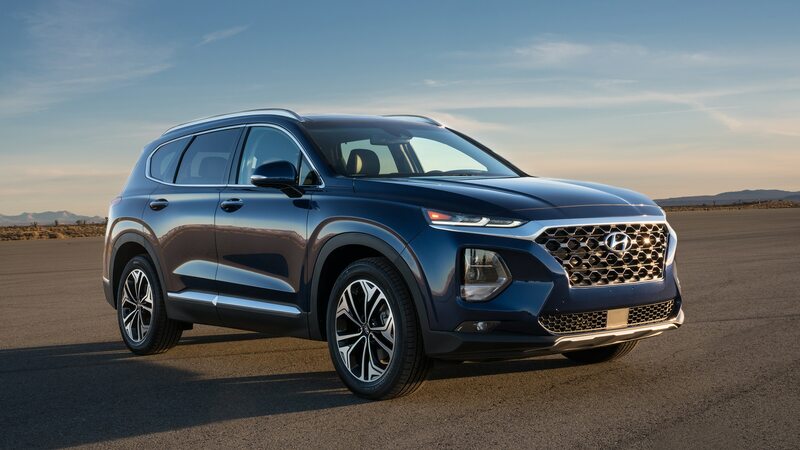 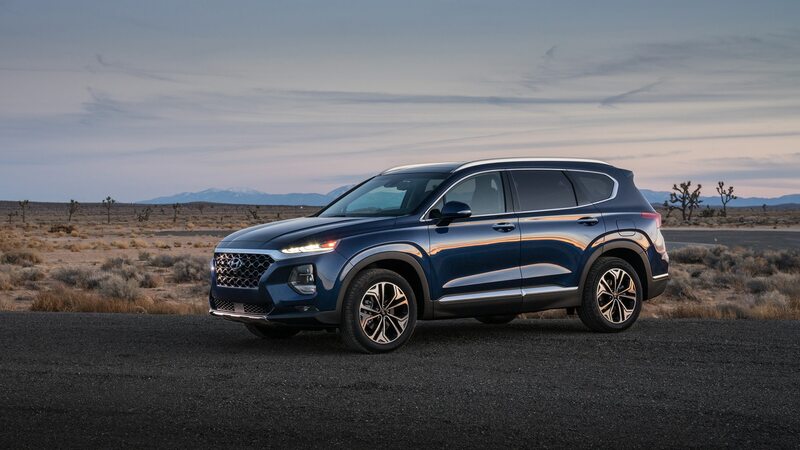 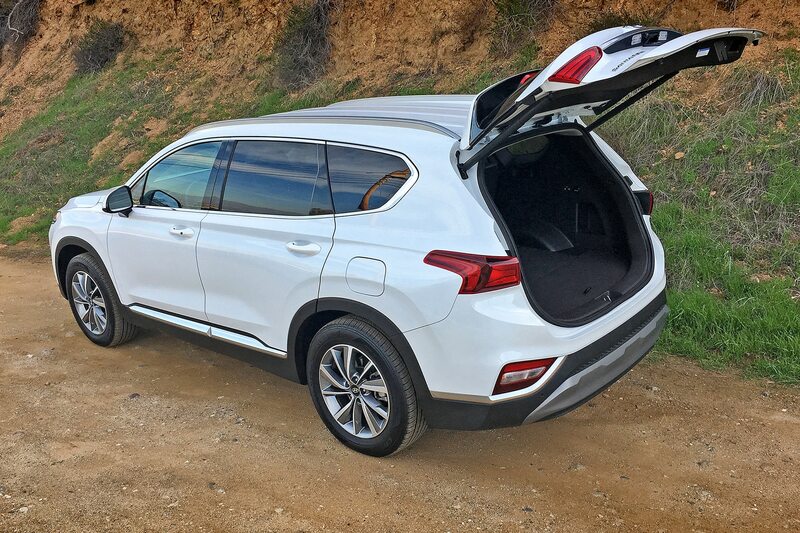 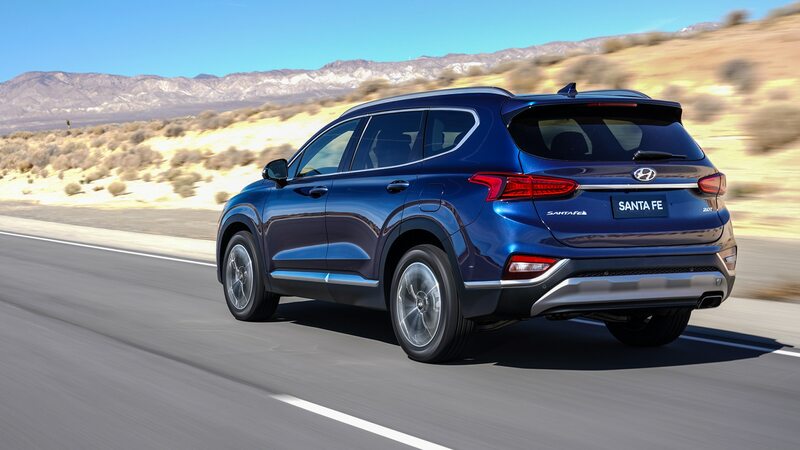 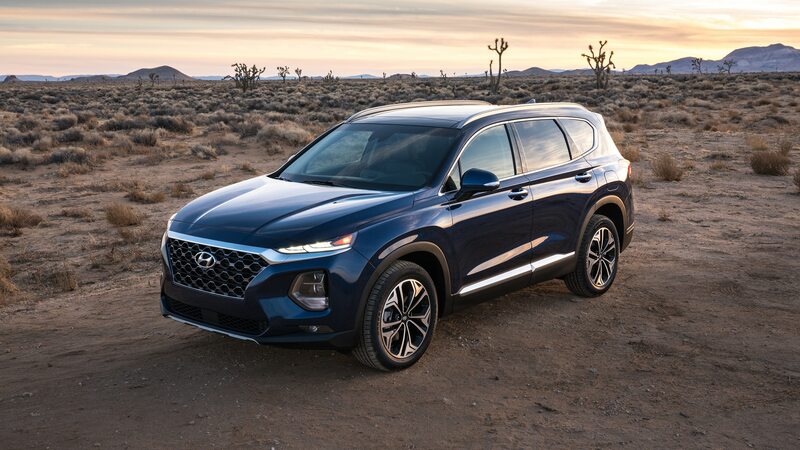 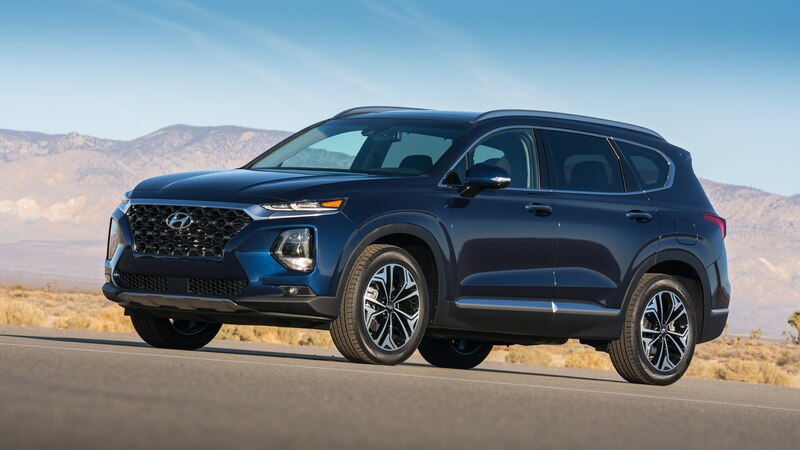 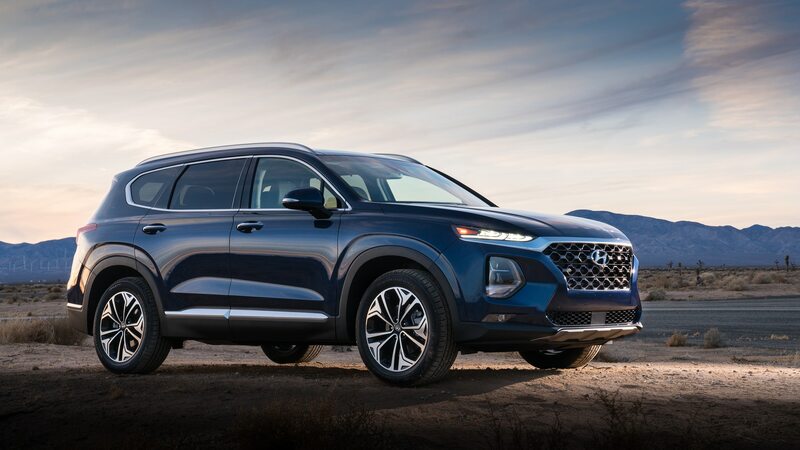 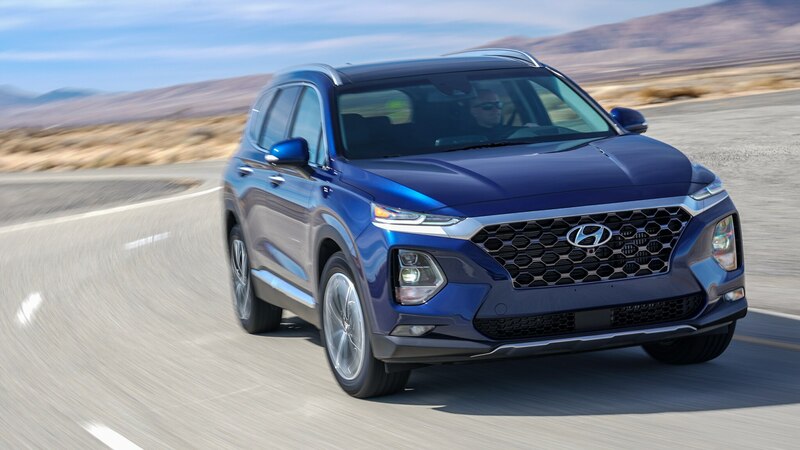 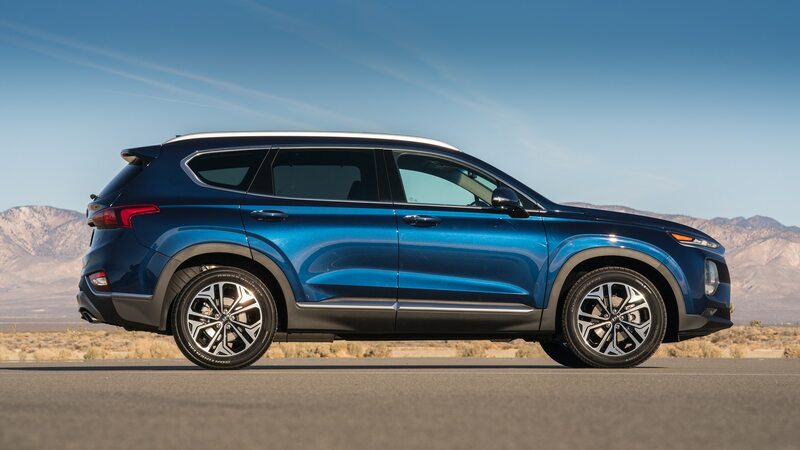 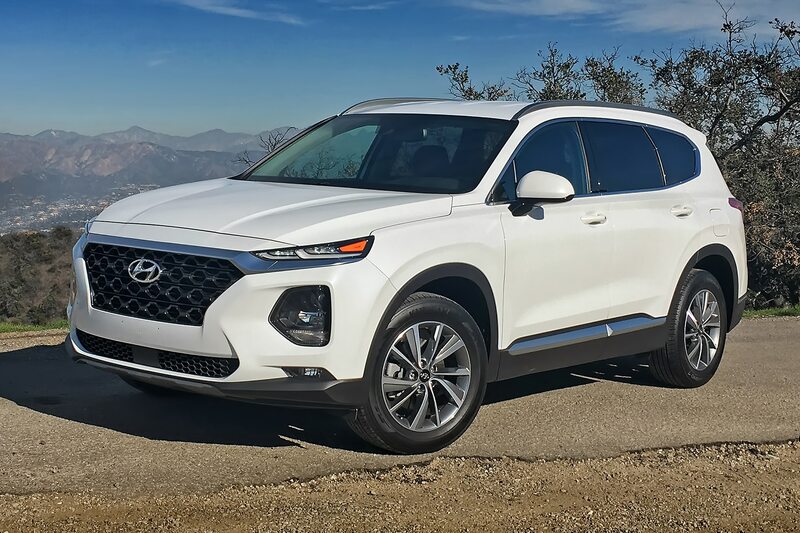 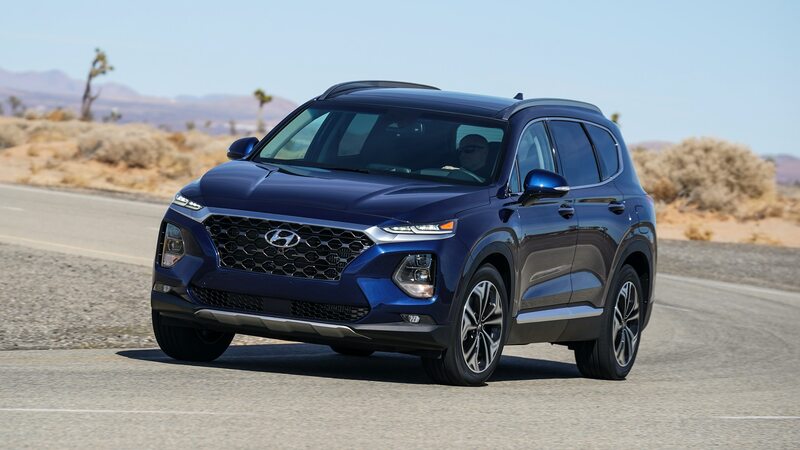 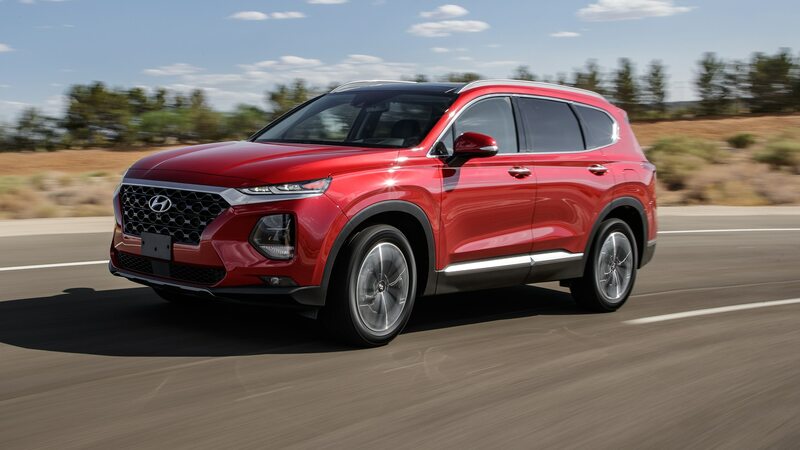 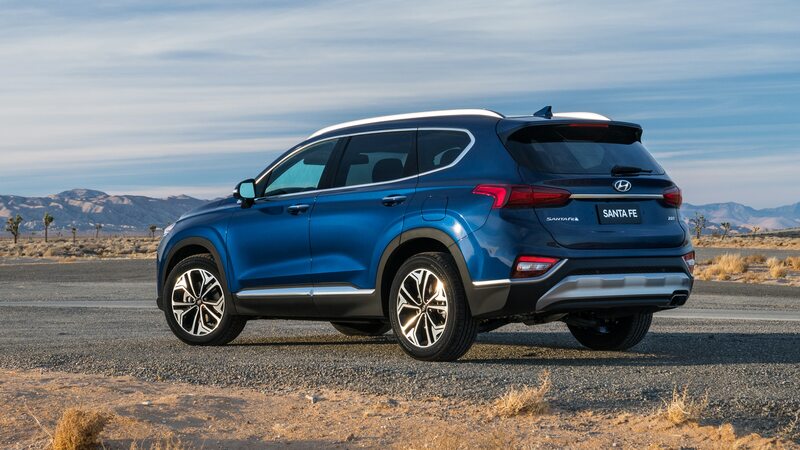 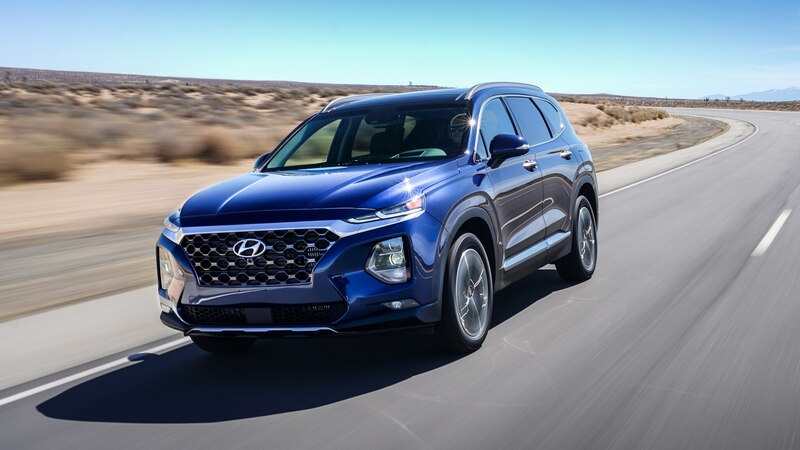 But at just under $31K with every feature above included, the new Santa Fe delivers a boatload of highly desirable amenities and safety tech, plenty of room for passengers and cargo, and a driving experienced that’s impressively refined and thoroughly competent. 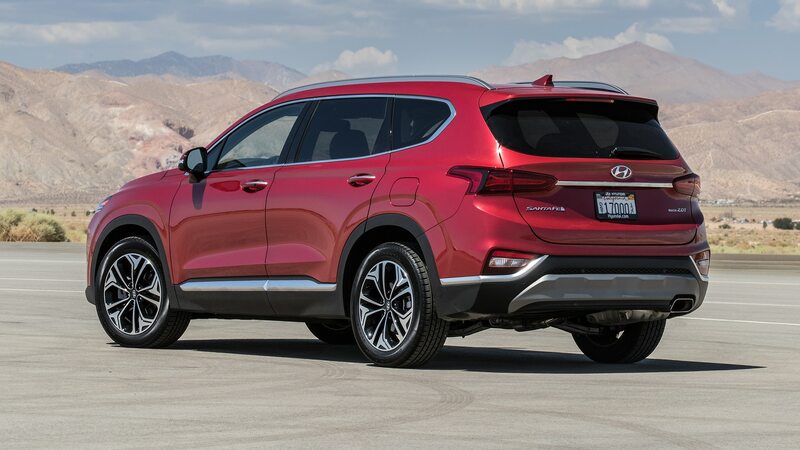 Besides, if you need more luxe, there are two even more impressively outfitted trims available—Limited and Ultimate—each with all-wheel drive and the turbo four optional. Hyundai was right to drop the “Sport” moniker from its 2019 crossover. 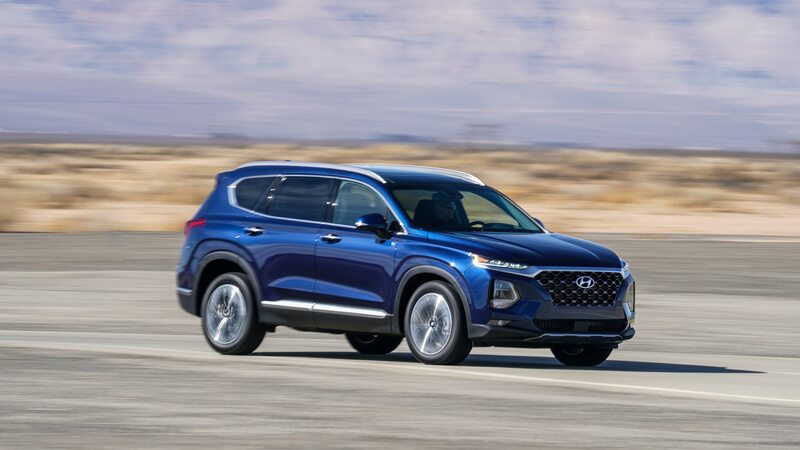 It’s everything else that the new Santa Fe does well.